The purchase is part of a nearly $750 million portfolio of buildings being acquired in the Seattle and Denver areas. Historic Smith Tower, Seattle’s original skyscraper, is being sold to Goldman Sachs. The New York-based financial giant confirmed the deal Tuesday, saying it was part of a portfolio of properties it is purchasing in the Seattle and Denver areas. It declined to comment further. Seattle-based Unico Properties, which bought the Pioneer Square tower for $74 million in 2015, declined to comment Tuesday. Update: On Wednesday, Unico issued a statement: “We are in the process of due diligence with Goldman Sachs, a potential buyer for a select portion of Unico Properties’ portfolio in Seattle and Denver, including Smith Tower.” It noted no sale has been finalized. A source with knowledge of the deal said the sale is part of a nearly $750 million package of properties – with about half that being spent in the Seattle area and half in Denver. The sale hasn’t been recorded and it wasn’t immediately clear what other local buildings were part of the deal; Unico owns about 30 properties in King County, mostly offices. The Smith Tower purchase is likely an investment play for Goldman. Built in 1914, the Smith Tower has historical landmark protections that prevent major redevelopment. Unico poured money into a renovation recently, including a redone observation deck that includes a new speakeasy. It was also renovated by a previous owner in 1998. Smith Tower’s ownership has changed hands quite frequently in recent times – Goldman will become the fifth owner in the last decade and a half. Before Unico bought it three years ago, Smith was purchased through a trustee sale in 2012 by affiliates of CBRE Capital Markets in New York; the group bid $37 million but no cash changed hands because CBRE was owed $44 million after foreclosing on the property. The previous owner, Walton Street Capital of Chicago, bought the tower in 2006 from the Samis Foundation for $44 million and initially planned to convert them to condos. That plan, which sent office tenants fleeing, imploded with the bursting of the housing bubble. The price of the tower likely won’t be broken out separately from the other properties in the deal when the sale is finalized; King County assesses it at $113 million. The 268,000-square-foot building at Second Avenue and Yesler Way remains mostly office space but also includes a notable pyramid-shaped penthouse on top. At 522 feet high, the Smith Tower was the West Coast’s tallest building for about a half century. It was the fourth-tallest building in the world when it opened. 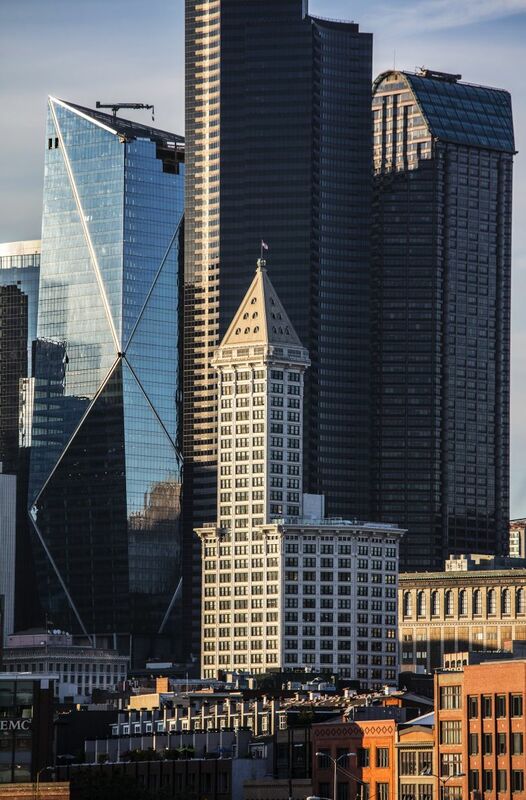 Now it’s dwarfed by other nearby buildings but still stands out on the Seattle skyline for its unique architectural style.